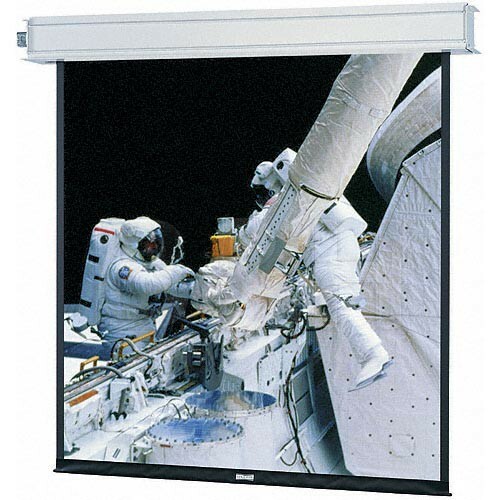 The Dalite 78 x 139" Advantage Electrol Projection Screen is a unique design. Construction of this ceiling recessed screen permits the case to be installed first and the fabric added later once a suitable projection surface is decided on. This is a big "plus" since companies constructing viewing rooms may not be certain of what they need in a screen. However, the Advantage permits the basic frame to be installed in the ceiling - ready for a finished fabric assembly to be added when all is prepped. The exceptionally quiet motor gives it an edge over similarly priced screens. Quiet "up" and "down" operation makes the Advantage more professional in appearance as well as less distracting to your audience. The Advantage Electrol has several options which make it a great choice for schools, lecture halls, libraries and corporate environments. Because it can be installed during the construction phase of your office, there is no pressure to buy a "finished" screen while budgets may still be on the table. The option of many remote controls also adds to its flexibility. Note: This item is ONLY wired for 220V, European voltage. The standard Advantage model will be ceiling recessed. It doesn't have the motorized door. Instead, it has a 2" slot on the bottom where the fabric drops out. The Deluxe version of this screen has a motorized door within which the screen retracts. Box Dimensions (LxWxH) 158.0 x 13.0 x 10.0"